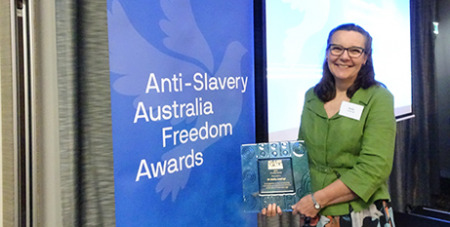 A safeguarding expert at Good Shepherd Australia New Zealand has been recognised by Anti-Slavery Australia for her outstanding work and contribution towards initiatives against forced marriage. Dr Kathy Landvogt was presented with the 2017 Freedom Award by Fiona McLeod SC, President of the Law Council of Australia, at Anti-Slavery Australia's annual awards ceremony on Wednesday. While Head of Good Shepherd’s Women’s Research, Advocacy and Policy Centre, Dr Landvogt was at the forefront of research into forced marriage and advocacy for increased protection and service responses for women and girls who are at risk. Dr Landvogt said she was honoured to be included among the individuals, organisations and governments recognised for their work to abolish human trafficking and slavery in Australia. “Forced marriage is an egregious abuse of human rights and is often a hidden form of violence against women and children,” Dr Landvogt said. Since Good Shepherd published Hidden Exploitations in 2012, a research report into Forced Marriage, Dr Landvogt has commissioned further research into the issue, resulting in the landmark report The Right to Refuse: Examining Forced Marriage in Australia. Among her many contributions, Dr Landvogt has co-chaired the Victorian Forced Marriage Network, presented widely at conferences and stakeholder forums, made policy submissions and provided expert commentary on the issue. Dr Landvogt’s work was recognised alongside initiatives by Norton Rose Fulbright, Konica Minolta Australia and Stop the Traffik Australia and Kate van Doore at Griffith Law School. Good Shepherd Australia New Zealand is committed to continuing its important work on the hidden issue of forced marriage in Australia, so women and girls can live a safer, fuller life.